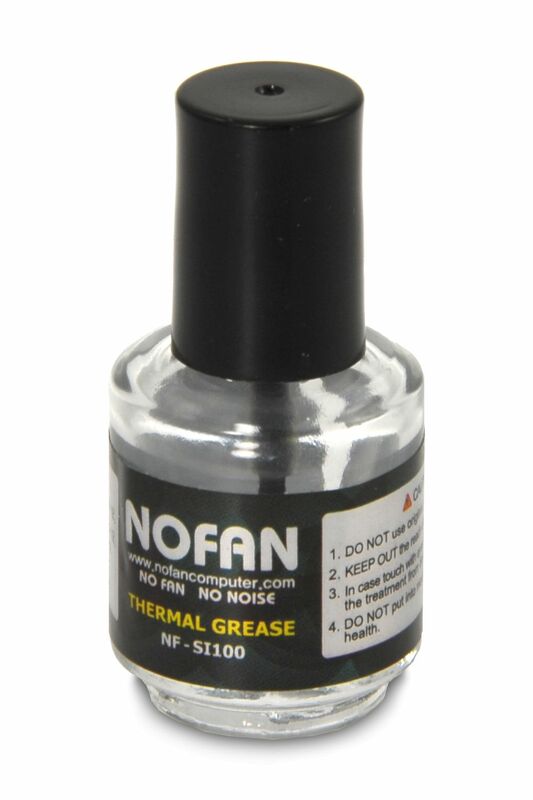 Nofan's own-brand thermal grease offers a big step up in CPU cooling performance over stock compounds. It offers maximum thermal conductivity and minimum electrical conductivity for best heat transfer between the processor and CPU cooler. Nofan's SI100 thermal grease will ensure an excellent thermal connection between the heat source (e.g. CPU) and heatsink. It maximises heat transfer by eliminating minute air gaps caused by the two irregular surfaces. It is conveniently packaged in a bottle which has a brush attached to the cap. This enables easy application and also prevents unnecessary waste of grease. Messy fingers are a thing of the past! The sealed bottle also ensures that the grease is kept fresh for a longer period of time. Clean any particles or residue from the contact surfaces of both the heat source and the heatsink. ArctiClean is an excellent product for removing any old thermal compound. Next, shake the bottle well and apply the NF-SI100 sparingly and evenly onto both surfaces. Finally, install the heatsink as per the manufacturer instructions.